Synopsis (via Goodreads): Twelve-year-old Artemis Fowl is a millionaire, a genius—and, above all, a criminal mastermind. But even Artemis doesn't know what he's taken on when he kidnaps a fairy, Captain Holly Short of the LEPrecon Unit. These aren't the fairies of bedtime stories—they're dangerous! Full of unexpected twists and turns, Artemis Fowl is a riveting, magical adventure. Jacob and I both enjoyed this book when we were younger, and we had a lot of fun sharing it with our son! Normally, we take turns reading to him at night, but always from separate books. We actually argued over who would read this one first, and eventually decided to co-read it and alternate chapters. 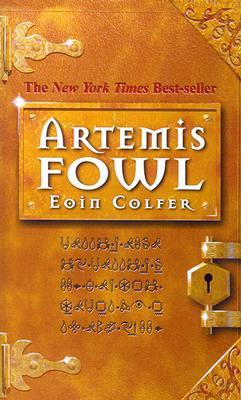 Artemis Fowl is simply a fun book to read! Artemis isn't a hero or a villain, but a child willing to take big risks if they promise an even bigger reward. He's a twelve-year-old genius, which is why people much older than him (namely Butler) respect his decisions and blindly trust his judgement. On more than one occasion, Butler followed directions even when he didn't understand what was going on. He trusts his employer explicitly, and Artemis is lucky to have someone so unwavering at his side. Personally, I would have called Artemis crazy and ditched him years ago. It's hard to say whether or not I like Artemis. I like that he's ambitious and seems to have a conscience, but I dislike that he was willing to use Holly and her people to achieve his goals. Yes, he felt bad once he'd interacted with her, but it didn't deter his plans. I would have been more understanding if he'd been in a life-or-death situation, but he was merely trying to reclaim some of the Fowl's monetary loses. He risked people's lives so his family would have more money to use for nefarious purposes. Regardless of his reasons, Artemis did try to keep the casualties to a minimum, and asked Butler to maim instead of harm those that attacked the house. However, some of the fighting (especially against the troll) became very violent and somewhat graphic. Eoin Colfer has created a fantastic world full of magic and interesting creatures. My son was particularly impressed by a kleptomaniac dwarf named Mulch Diggums. He excels at tunneling underground and isn't bound by the rules those with magic have to follow. He's able to unhinge his jaw so he can swallow soil and rock, only to have it pass through his body and out the other end (gross). My son thought the overall process was fascinating and laughed when Mulch used the gas in his body as a weapon (yuck). Holly is a wonderful character that's always trying to do the right thing. I liked that she was willing to help Artemis and Butler despite being their captive, because their lives were more important than their transgressions. I really enjoyed her perspective within the book, and I'm looking forward to re-reading the rest of this series with my son and husband. If you're looking for a fun MG book, Artemis Fowl can deliver! Edit: I had no idea they were making an Artemis Fowl movie! I stumbled across the trailer this morning and couldn't resist adding it to my post. What a lovely coincidence! I think I read this one years and years ago but just didn’t connect to the story so I never continued the series. Seems like I remember it becoming a pretty lengthy series. How cool that it’s being adapted! I hadn’t heard that. I've never heard of this book but I can understand why you all like it. Look at that timing! I still haven't watched the trailer yet, nor have I read this one. Mulch would be mu favorite character! It's crazy that my review posted the day the trailer came out! What a coincidence, right? I initially read this book years ago, but only recently shared it with my son! It'll be a fun movie for all of us to watch together. Hopefully it's an accurate representation of the book! I read these with my son and my oldest daughter had a good time with them. I haven't read them in ages! I'm looking forward to experiencing the books for a second time, and jogging my memory in the process. It's great that you read these with your kids, too! Do you think you'll watch the movie when it comes out? I still can't believe I wrote this review the night before the teaser trailer aired! 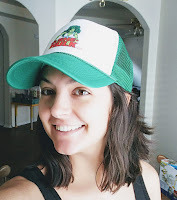 My husband and I watched it together, and we're curious how accurate the movie will be. We already noticed some inconsistencies within the trailer. Also, Butler is being portrayed by an actor we both love in the TV show Zoo! We're really excited about that casting choice, and I also like that they chose to have a woman play Commander Root's role. I remember reading this book and enjoying it when I was younger, but haven't thought about it in ages... and then it was trending the other day because of the movie. What a fun coincidence! I loved that you were able to share this book with your son! Also In love the little icons you have, are those new? !